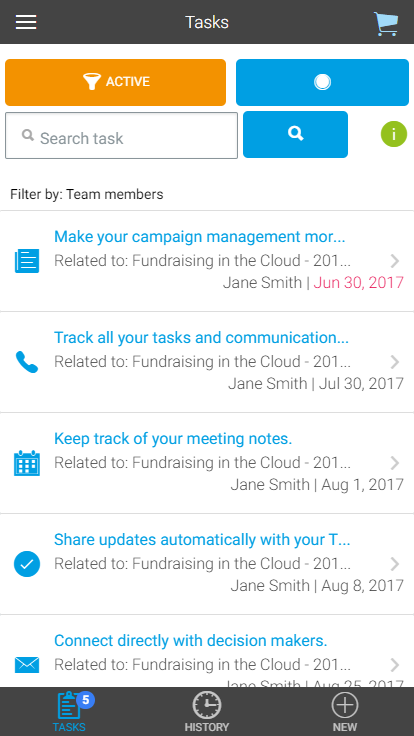 The Tasks page displays your and your team’s task and task history. Per default, the page is set to show only your own tasks and history. To see your team’s task, remove the filter. The filter is the grey box above the Tasks tab. Close it to remove the filter.. The list on the Tasks tab is sorted by due date. Overdue and soon due items are displayed at the top of the list. The History tab shows all tasks that were marked as “Done” and is sorted by due date. When a new task is set up, it is assigned a task subject. In the list view, the type of subject is reflected by an icon. A solid blue icon indicates a new, unread task that was assigned by a team member or an unread Email that was sent to the advinda app from outside the system. 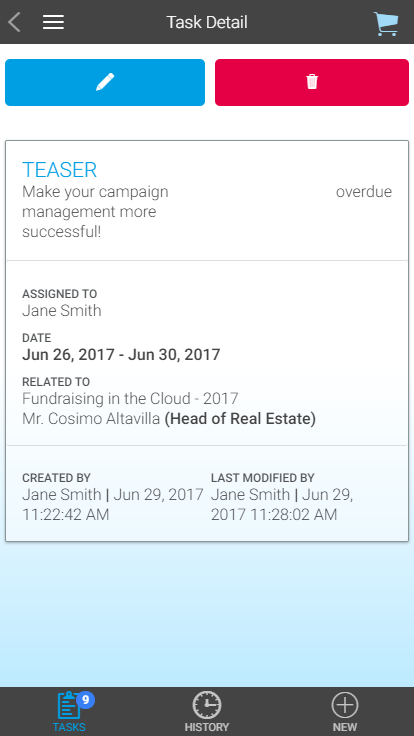 You can access the details of a task by clicking the task in the task list. To create a new Task click “New +”. Related to: You can specify to which Campaign, Contact or Account a task is related to. Select from the dropdown the relation type and a pop-up will open. You can search for a campaign, account or contact within the pop-up. Fields marked with an asterisk are mandatory. If you want to change a task’s status or edit its other information, click “Edit” on the task detail page. 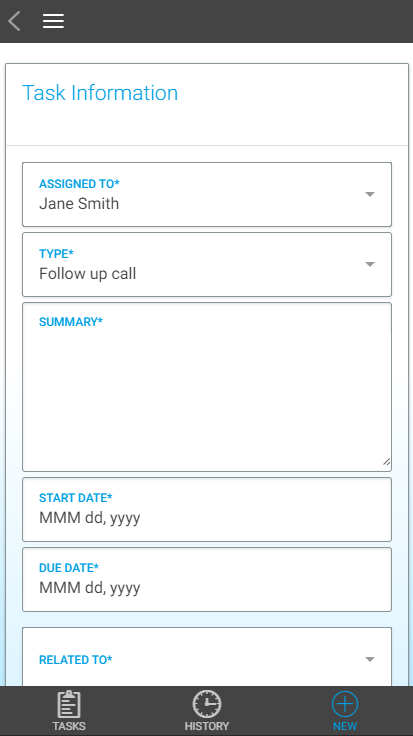 You can edit all information, assign the task to a different team member or relate it to another contact. To complete a task, change its status to DONE. This moves the task automatically to the History tab. 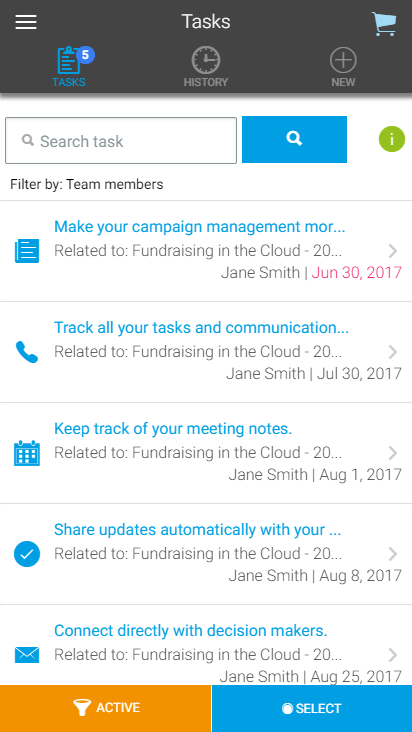 You can navigate between tasks, task history and creating tasks using the bottom bar. Commands can be found at the top. You can navigate between tasks, task history and creating tasks using the top bar. Commands can be found at the bottom.